Baffled about what to send? Or perhaps you want to surprise them with a one-of-a-kind, artisanal arrangement? 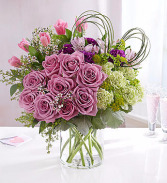 With our Deal of the Day bouquets, you pick your price and our expert florist designers exercise their creativity to design a beautiful bouquet using the freshest seasonal flowers available. 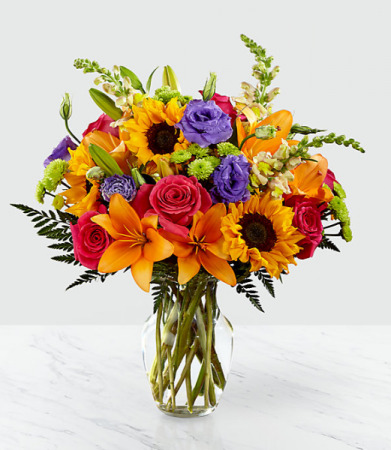 When you send a Deal of the Day bouquet, you can feel confident knowing a floral designer will create an unforgettable flower arrangement with their own signature style and flair. Please note that flowers and designs will vary as our artisan florists work with the freshest, in-season flowers and their own personal inspiration - but you can be sure your bouquet will delight! She'll always be your #1 lady. Remind her just how special she is - send a sensational gift she'll never forget. 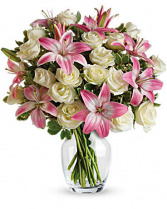 This beautiful bouquet of fragrant pink lilies and lush white roses is sure to make an impression! white roses are mixed with pink asiatic lilies and variegated pittosporum in a classic clear glass rose vase.